It’s funny how I take the busiest time in the year to update my blog. But anyway, a report on World Pair Go is long overdue. 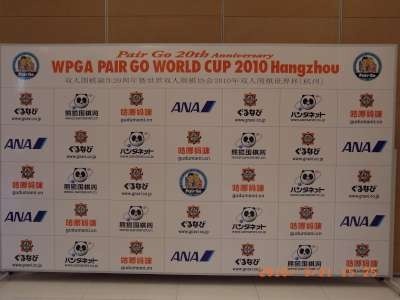 Pair Go World Cup 2010 was held in Hangzhou, China in commemoration of Pair Go Association 20th anniversary. Malaysia qualified for the final round after coming out second, behind Singapore for the Asia selection ( minus China, Japan, Korea). This tournament was participated by 16 teams in total, where 8 were professional teams, and the rest were amateurs which won the preliminary round in their respective region i.e. Europe, Asia, Africa, America. 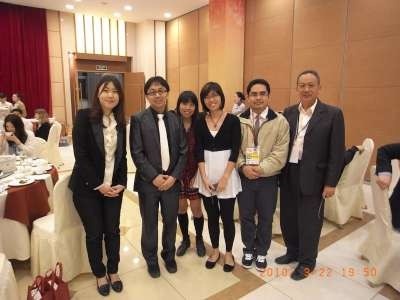 The eight professional teams are from China, Korea, Japan and Taiwan. Each country sent out two teams. Below are the pics. Female players are named first, followed by their male partner. 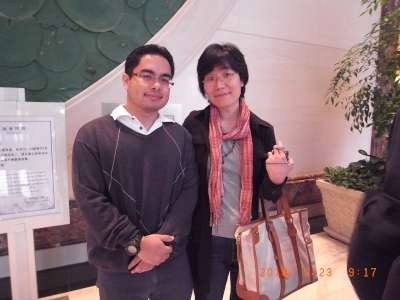 China Pair: Song Rong Hui (5d) , Xie He (7d). 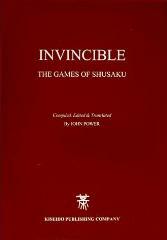 There is not much to say about the game except that Suzanne started with tengen. The follow up was horrible though because she and I had totally different idea of using the center stone. Anyway, we would have lost but it felt quite like a throw away game, so I did not feel too great. Mok Jin Seuk was apparently a friendly person, who initiated chat in the elevator 🙂 . When we happened to meet again during the match, he asked about Go development in Malaysia. Evidently, he was quite sad knowing that there are only 100 players in Malaysia, with only 30 active. Honestly, those were just random numbers that I spew out. Hopefully MWA could come out with statistic so that I don’t misinform people anymore. The final result was that China’s Song Rong Hui and Xie He won the first place after winning by resignation in the final against Korean’s Lee Min Jin and Mok Jin Seuk. The game itself was amazing. Two dragons were in conditional seki, as there was a ko. 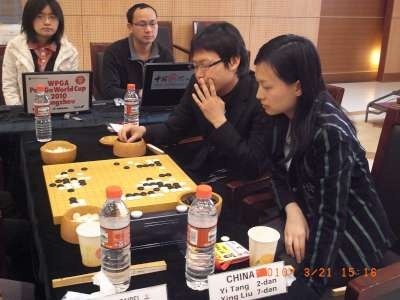 Towards the end, the Chinese team started filling the opponent’s liberties, ignoring ko threats that the Korean made. They eventually captured the group, forcing resignation. 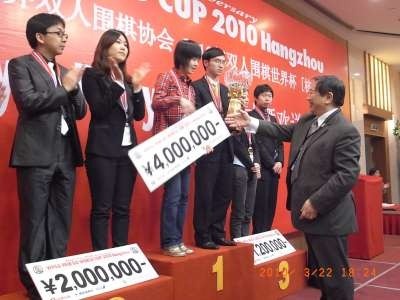 Yea, they won 4,000,000 yen but if I understand correctly, the China Weiqi association will have a 70% share in the money prize. Suzanne and I also were given 100,000 yen to share. No tax will be imposed by MWA because there was no prior agreement. However, from now onwards, MWA will have 30% share from the earning that we win although more contribution will be encouraged. 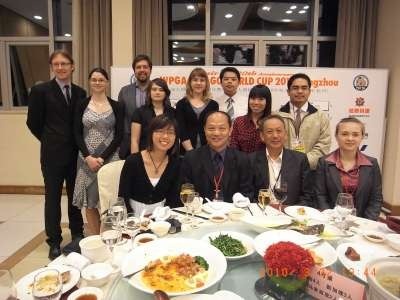 The amateur players except for professional Kang Zhang Bin and Singapore’s official, Mr Tan. 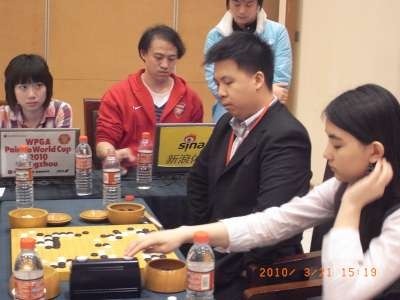 Jie Li ( amateur 9d ) vs. Joanne ( professional 1p ) in friendly match.